A campaign warning of the consequences of drink driving has been launched by the Scottish government ahead of the festive season. The most recent figures estimated more than 1 in 8 deaths on Scottish roads involved over-the-limit drivers. Motorists lose their licence and have a criminal record lasting 20 years when they are convicted of drink driving. The FestiveDrink Drive 2013 campaign aims to reinforce this message over the Christmas and New Year period. Drivers have been advised not to drink at all before getting behind the wheel over the festive weeks, as the risk is too great. The amount of alcohol it would take to be considered over the driving limit is different for each individual and has a number of variables, including weight, gender and metabolism. Justice Secretary Kenny MacAskill said: "Our priority is to save lives. But some drivers are still not heeding the warnings and around 30 people are killed every year in Scotland due to drink driving. Over 20,000 drivers are stopped by police in Scotland every month. "Having even one alcoholic drink, then driving, makes you three times more likely to die in a car crash. "Our message has always been clear - don't ever drink and drive. Even if you are just over the limit, in the eyes of the law you are still a drunk driver and a criminal - there is no grey area." The campaign was launched in partnership with Road Safety Scotland and Police Scotland. Supt Iain Murray, head of road policing at Police Scotland, said: "Every year we raise the issue of drink driving and every year there are still people who break the law with no consideration for others. Drink or drive, it's your choice but you cannot do both. "If you think you are ok as you've only had 'one' or a couple of small drinks think again, it doesn't matter whether you're just over the limit or well over the limit - you're a drunk driver. There really is no excuse. 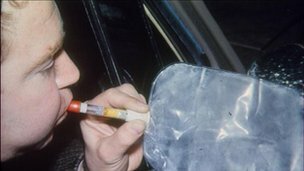 "If you are stopped by police and fail the breath test, then the fact that you couldn't get public transport, you have an unexpected emergency to attend to or you thought it was a small measure, won't make the slightest bit of difference to officers; you will be arrested. He added: "Our message is clear, if you intend to drink or have been drinking - leave the car. Don't risk it."